For any demand, please contact us. Our team will be pleased to answer your request. Motorways A8, A57 or A50 > exits Hyères, le Muy ou Brignoles. Take a shuttle from Hyères train station to Hyères bus station (Gambetta), line 39 or 67 (Réseau Mistral). At the bus station, take bus line n°7801 or 8814 (Varlib) to get directly to Lavandou. Take bus line n°7801 or 8814 (Varlib) outside the train station to get directly to Lavandou. 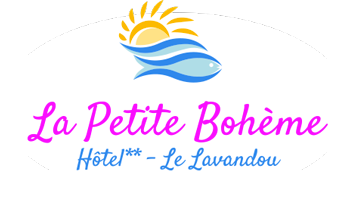 La Petite Bohème is 250 meters away from the bus station. Transfert from the airport to Hyères city centre with bus n°102 (Réseau Mistral). At Hyères’ bus station (Gambetta), change for bus line n°7801 or 8814 (Varlib) to get to Lavandou. Direct transfer from the airport to Lavandou during high season, bus n°7803.